One of my very favorite seasons of the year is Advent, which begins next Sunday. While most of the world around us is in a full-throttle Christmas tizzy, I love the idea of quiet and peaceful waiting – an antidote to hustle and bustle. We began attending Episcopal services when our oldest child was three, so the idea of family traditions for this new season I’d never celebrated intrigued me. What are some meaningful ways to ‘celebrate the season’ when you are, technically, still waiting? A short and simple answer soon made its way to us, and more directly, our dining room table: the Advent Wreath! Now, there is a lot of information and minutia and ‘rules’ out there about Advent wreaths. There are certain candles, colors, and even prayers you can use for each Sunday. The depth to which you want to dive into the history and meaning is almost endless. But I’m not going to do that to you. Because frankly, when you’ve got a preteen on hand with only so much attention they’re willing to give a project, a toddler who is obsessed with fire, and a dog looking to run off with the Light of Christ at a moment’s notice, you gotta work fast. My mantra? If we can get it done without tears, it’s holiday bonding time well spent! And so, if you want to mark Advent in a meaningful and minimum stress way, these are the supplies you’ll need: four or five candles, and a wreath of some sort. Sound simple enough? If you’re game, let’s get started! The basic premise of an Advent wreath is to mark the four Sundays of Advent in an intentional way. The first Sunday you light one candle, the second Sunday two candles, the third Sunday three candles, the Fourth Sunday four candles. If you’d like to mark Christmas Eve, you light a candle in the center as the light of the coming Christ child. 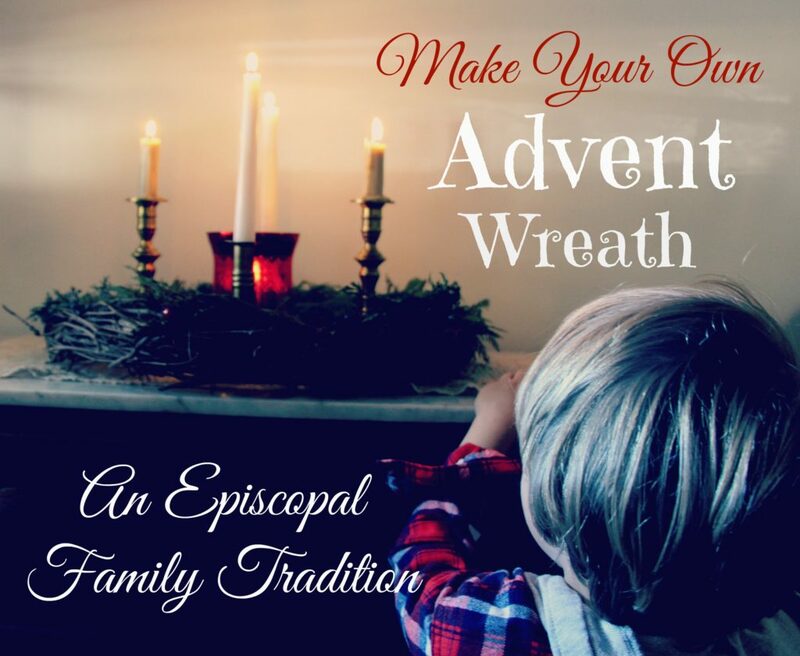 What I love about the tradition of the Advent wreath is that it gives an instant sense of reverence and specialness to the end of the day, and my children have always loved the process of making the wreath and then lighting the candles. In that moment of lighting the wreath, the noise and rush of the day can settle into a soothing quiet. It’s a good way to start a conversation with kids about what they may have heard that day in church, to say a short prayer as a family, or share blessings. This small act of making an intentional time to observe Advent as a family not only brings the meaning of the season into focus, it is also an easy way to come together as a family during a busy time of year. If you’d like to make a traditional Advent wreath, the traditional method is to use three purple candles, one pink candle, and a white center candle (if you’re lighting a candle for Christmas Eve). Depending on a particular family or church’s tradition, the candles can stand for ‘hope, love, joy and peace” or “expectation, hope, joy and purity.” The pink candle is always the third to be lit, which is a celebration of ‘light overcoming darkness’—since more candles are now lit than are not. However – and please take this to heart – I am a big fan of working with what you’ve got. If what you’ve got are a pack of red holiday candles, or battery operated votives, have at it! Do not let the details get in the way of your enjoyment of the season or psych you out of creating a meaningful tradition for your family. The intention is what matters, not the right hue of candle or the type of wreath you create. And what you make the wreath out of is the fun part! You can make it correspond to your décor—more classic or modern or country. You can use a metal frame with the candle holders already on it, or you can use a pre-made wreath from the craft store with the candles set around it. There are also pieces of nature that are perfect for making the wreath if you keep your eye out for them. I’ve found that the best natural materials are the ones that will keep their color and not fall apart if they are taken inside for the next month. 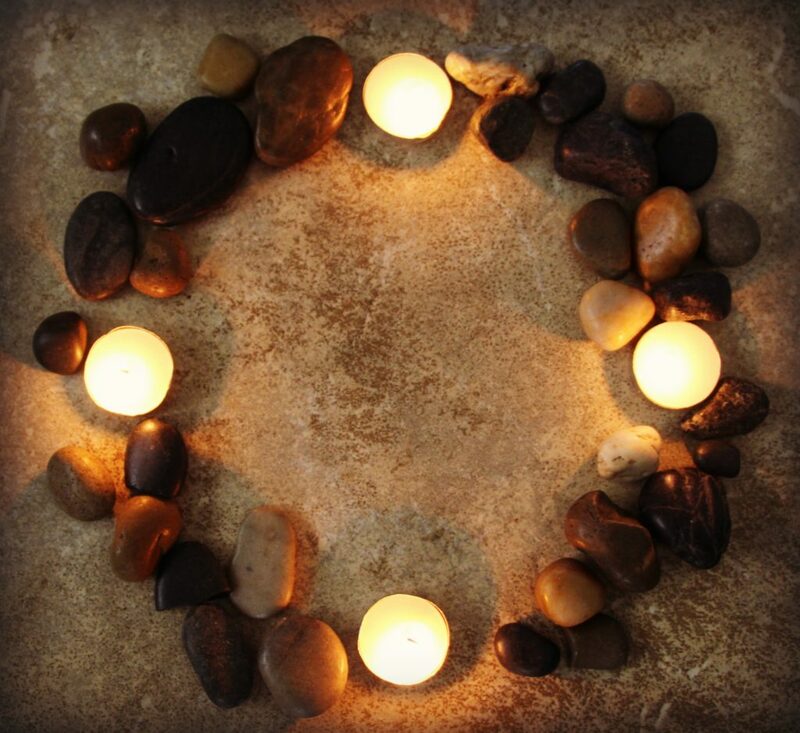 You could even make a wreath from a circle of stones, or collect greenery that will keep well when picked such as cedar or pine branches, boxwood, holly or magnolia leaves. Collecting the bits that will become the family wreath is a fun project in of itself. One hint about using things from outdoors though – always put your greens in a bag and put it in the freezer overnight before using. That way no creepy crawlers unexpectedly come out of the Advent wreath in the middle of dinner! However you choose to go about making your wreath, I hope you and your family have fun. It’s a project rife with fun – starting with collecting the pieces to make it, putting it together, and then taking part in the season-long tradition of lighting the candles. 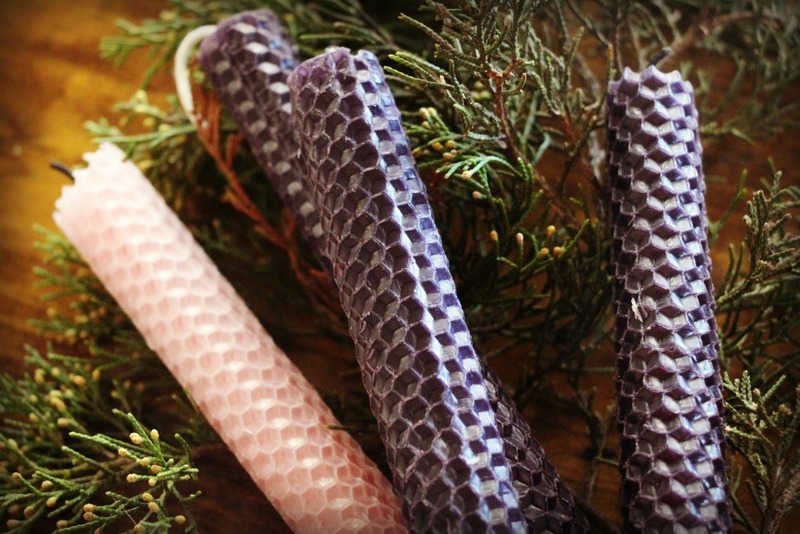 Research it if that’s what you love – source beeswax candles made in a monastery or make your own candles! But if that overwhelms you, go to the store and get whatever you can find pre-made, or collect what you can find in your yard and pantry and get creative. Believe me, your children won’t remember what kind of candles you used, or how fancy the whole set up is. What they will remember most is this time with you – of getting to help and be included. And it will also make an impression on them about what the season of Advent truly means, and the joy that can be found in the waiting. 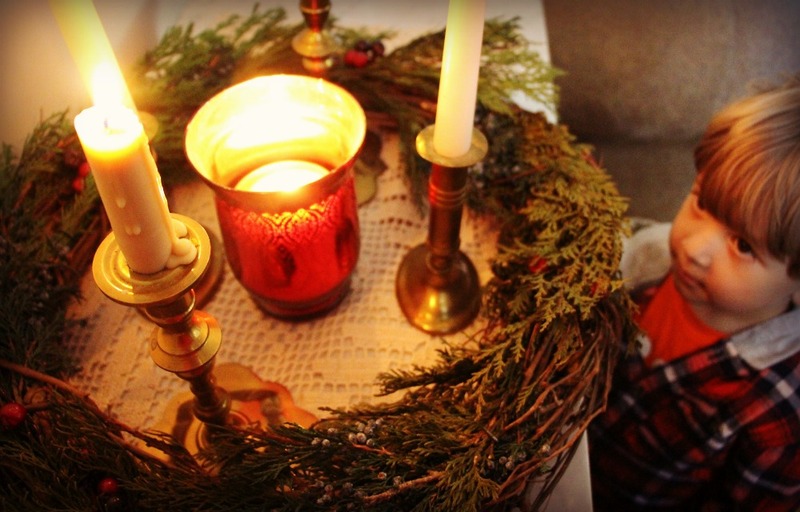 What type of Advent wreath does your family use? Interesting ideas – thank you. I love the wreath of stones!